PC parity on the way. 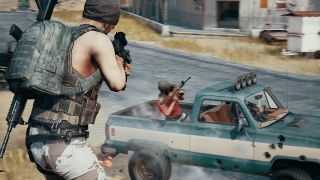 It may be losing mindshare these days to its battle royale rival Fortnite, but PlayerUnknown's Battlegrounds fans have some good news today – the game is finally leaving the Xbox One early access Game Preview program. From September 4, gamers will be able to get the game in its so-called 'gold' state, alongside a 1.0 update that will bring a new fast-paced Sanhok map with a dynamic weather system and new weapons. A War Mode deathmatch is also being introduced, along with in-game microtransactions for cosmetics and the new Event Pass, which unlocks sensitive challenges within the game. Being a live, ever-evolving game, that won't be the last of the updates to come to the PUBG fray, with the 1.0 update hopefully bringing more synergy between the Xbox One and PC update schedules. On top of the full release news comes the introduction of a limited edition PUBG pad. The Xbox One controller features "exclusive trigger grips", and a digital camouflage design. It will be up for pre-order from Microsoft's online store, and it ships in October for $69.99 (around £55, AU$95).